It monitors line to neutral and neutral to earth voltages and one current signal that accepts rogowski coils or traditional current clamps. Flicker Measurements are made to IEC 61000-4-15. Data is retrieved via an infra-red or (optional) Bluetooth serial port. Date and time, recording length, recording mode, sample rate, math channel usage and more can be configured from a laptop or personal computer via the serial port. 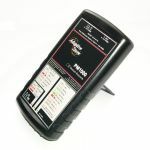 Simply plug the PM1000 into the mains or attach to the power to be measured and it will start to record automatically. You can configure it in advance and store 'set ups' on the computer or on the logger. Click to view the PM1000 datasheet. Measures current up to 1,000 Amps and voltage between 0 and 270 Volts on a single phase power supply. The degree of synchronisation observable between recorded parameters e.g. volts and current can help to determine the source of the disturbance i.e. upstream or downstream. 13 pre-stored configurations allow you to get started straight out of the bag.